Not to be confused with Number Cruncher. Number Crunchers is a 1-Vs.-3 Mic minigame in Mario Party 7. This minigame is set in a lava-filled area, possibly a volcano. Its name originally refers to people or computers that manipulate large amounts of numerical data. The team of three are standing on the blocks. The single player speaks into the microphone, causing several Thwomps to fall. The solo player can call out commands by speaking into the Mic. These commands are "1", "2", "3", "Circle", and "Square". The "1" command will cause Thwomps to slam onto all pillars with the number 1 on them, the "Circle" command will cause Thwomps to slam onto circular pillars, and so forth. There are three pillars for each number. Of these nine pillars, four are circles and five are squares. 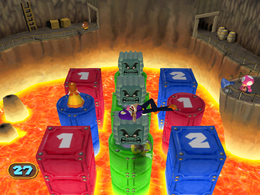 The other three players must avoid being crushed by the Thwomps and falling into the lava. Whoever wins will do their victory animations. Mic – Say: "1", "2", "3", "Square", "Circle"
Rules – "One player speaks commands into the Mic to drop Thwomps while the other players try to avoid being smashed!" Advice – "Once dropped, Thwomps must rise completely off the screen before they can be dropped again." This page was last edited on July 31, 2018, at 23:18.